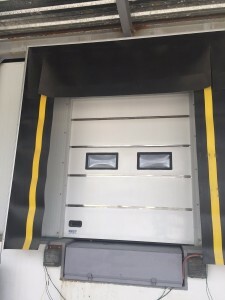 Loading bay contains dock shelter, dock leveller, sectional door is providing integrated solutions for loading and unloading processes and the management of access through industrial enclosures. - Dock shelter: A loading collapsible dock shelter uses a sturdy curtain made from durable material for the closing of the area between the opening of the warehouse and the docked vehicle. They provide an optimal sealing of the vehicle during docking and, simultaneously, ensure maximum flexibility. All curtains are finished with a wear-resistant, hard antistatic PVC top coating. The side curtains are provided with approach markings which serve as visual guides for the drivers to guide the correct manoeuvring of the vehicle into the shelter. - Dock leveller: The loading system swing-lip dock-leveller is an electro-hydraulic dock leveller with a hinged swing lip. Both the platform and lip are hydraulically driven. The lip angle can be adjusted to suit your specific application. It is operated by means of a single button which raises or lowers the platform from its rest position. The lip automatically extends when the platform reaches the highest position. - Sectional door: Our doors are specifically designed for intensive industrial applications and are manufactured to the highest quality standards. When the door is opened, the door panels move under the ceiling or move vertically along the warehouse wall. The door panel finish of food-grade fiberglass guarantees durability, optimal insulation and low lifetime maintenance costs.